The Innovative Instructor is a print series for articles on teaching excellence at Johns Hopkins University. Written by Hopkins faculty or campus instructional technology experts, the goal is to increase communication about effective teaching solutions and how to achieve them. 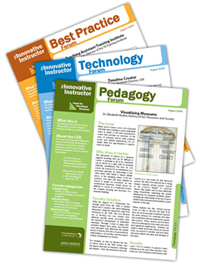 Through these articles, instructors can share successful teaching strategies, learn what colleagues are doing, and discover new technologies and skills for the classroom or professional development. To learn more about this series or to write an article, contact cerweb@jhu.edu or call Cheryl Wagner at 410-516-7181. 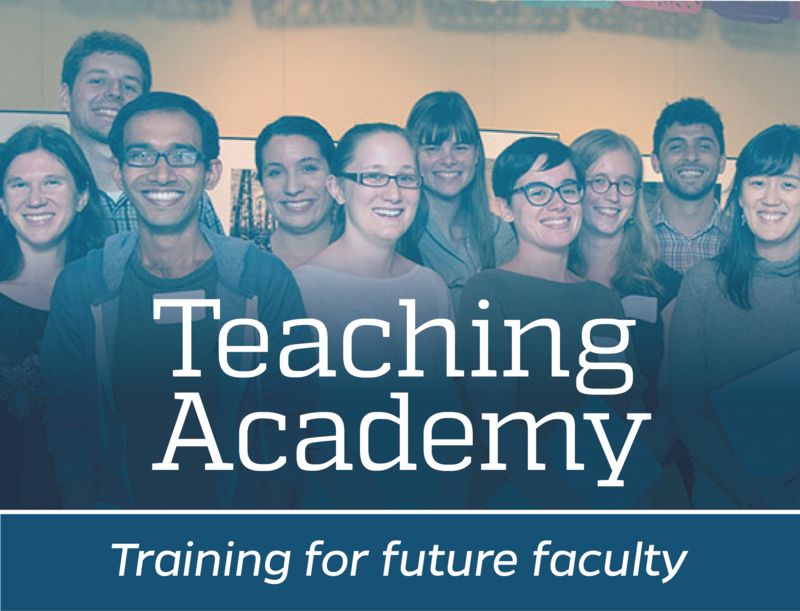 Pedagogy: Hopkins instructors share successful strategies for teaching excellence. Technology: Information about emerging technologies, who is using them and why you should know. Best Practice: “How To” guides on using technologies and applying innovative instructional methods. Sign up for a semi-annual email alert when new articles are available. Sign up form or unsubscribe using this link. No items on the page match this filter. Either, clear the filter and try again or reset the search. What do course grades mean? What do they actually measure? In this age of grade inflation and widely varying standards, both teachers and students struggle to define what an A, B, or C in a course really means in terms of student learning and achievement. At the same time, many teachers are overwhelmed by their grading load and are looking for ways to reduce and simplify it without trivializing their course assignments. Writing test questions is a daunting task for many instructors. It can be challenging to correctly assess students on the comprehension of course objectives. Multiple choice questions are no exception; despite being very popular, instructors often struggle to create well-constructed questions. Tcrunch is a mobile application that enables more efficient and frequent instructor-student communication. You can think of it as an electronic version of the teaching strategy called an exit ticket. A traditional exit ticket is a 3x5 index card given to students at the end of class; the instructor asks a question to solicit formative feedback from the students. With Tcrunch you can do the same thing, but the app eliminates the paper, performs all collecting and analyzing activities in real-time, and emails the results to you. One of the more challenging aspects in developing a new course is choosing an appropriate educational technology to achieve my learning goals. The material in my course “Creating Sacred Space in the Ancient and Medieval World” lent itself to a visually focused approach to help students understand these sacred spaces and interpret the intents of their creators and builders. The course engaged students with undertaking their own research about ancient spaces and the culture that surrounds them by studying floor plans, technical drawings, photographs, and other relevant images. Ideally, the way to explore broad questions about what makes a place sacred and how it differs from other spaces is to include visual references to provide spatial context that can be aligned with material meaning. SketchUp is a three-dimensional rendering application that uses a sketch-based approach for creating models. It may be beneficial to anyone looking to visualize three-dimensional structures, spaces, or objects. With a free-to-use version available for download, SketchUp is an affordable way to develop 3D models. It is easy to learn compared to professional 3D graphic software packages. Visual design, in the form of advertisements, entertainment, functional signage, etc., can be seen everywhere. You are constantly processing visual information to make sense of the world and, often unconsciously, you place value judgements on what you see. It is important to consider this when designing or creating visual content for presentation, as there are a number of design strategies that will make that content clear, persuasive, perhaps even beautiful. Visual clarity will help to improve the delivery of the message. This article provides principles that will help you to create clear and concise visual design. In the global environmental politics classroom, the problem of student attitude is often acute: students of global environmental governance are particularly prone to negative emotional reactions, including feelings of helplessness and hopelessness, which can engender apathy and cynicism. ArcGIS is a powerful data mapping application that helps you visualize, analyze, and understand spatial data mapped to a coordinate system. Used in the sciences, engineering, and the humanities ArcGIS can reveal relationships, patterns, and trends related to physical spaces in ways that may not have been initially apparent. In addition to mapping objects on the Earth’s surface, there are 3D solutions that allow above and below surface examination. It is also possible to work on expansive scale, e.g., the universe or on a small scale, e.g., the human body. In essence, if it can be mapped, ArcGIS is the tool to use. Traditionally instructors have used assessments such as midterm exams, final projects or papers, or recitals to measure how much students have learned up to a particular point in time. These are referred to as summative assessments; the goal is to evaluate student learning at the end of an instructional unit. However, many instructors use assessments throughout the semester to help students identify their strengths and weaknesses. These activities are called formative assessments and are generally low stakes, meaning that they have low or no point value. Formative assessments focus on learning and teaching, rather than on evaluation or grading. Humanities scholarship has made progress in examining the usefulness and effectiveness of digital tools for addressing core disciplinary questions and for launching inquiries that stimulate new interdisciplinary perspectives. Fewer models exist for integrating digital research approaches into teaching, particularly around objects. Yet digital technologies have transformed how we create knowledge about and how we experience things. Reveal is a web application for annotating images with multimedia content. Using Reveal, you can create a website where highlighted areas, called hotspots or annotations, placed on an image link to other pages with images, audio, and/or video resources. Because the application allows you to build a hierarchical website, the individual pages created can be annotated further with hotspots that link to ‘child pages’, allowing you to express another level of information. For example, a map of the United States could have hotspots that provide links to pages of regional maps, which in turn may contain their own hotspots. The application is particularly useful for expressing visual relationships and spatial context. Effective teaching depends upon effective planning and design. The first step in preparing a high quality course is to clearly define your learning goals, which are the broad, overarching expectations for student learning and performance at the end of your course. 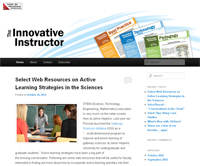 (See “Writing Course Learning Goals “in the Innovative Instructor series.) Next is to determine your learning objectives by writing explicit statements that describe what the students will be able to do at the end of each class or course module/unit. This includes the concepts they need to learn and the skills they need to acquire and be able to apply. In the fall of 2014 I taught a course, Stuff of Dreams: How Advances in Materials Science Shape the World, in the new Whiting School of Engineering Hopkins Engineering Applications & Research Tutorials (HEART) program. The program introduces undergraduates to engineering research in specific disciplines in a small class taught by advanced graduate students or postdoctoral fellows. The classes meet once a week for two hours for six weeks. The challenge of teaching these one credit, pass/fail courses with no requirement of the students beyond class attendance, is getting the students engaged. CATME, which stands for ‘Comprehensive Assessment of Team Member Effectiveness,’ is a free set of tools designed to help instructors manage group work and team assignments more effectively. It was developed by a diverse group of professors with extensive teaching experience, as well as researchers and students from across the U.S. First released in 2005, CATME takes away much of the administrative burden that instructors face when trying to organize and manage teams, communicate with students, and facilitate effective peer evaluation. It is now used by over 1200 institutions in 63 countries. Created in 1956 by Benjamin Bloom and his collaborators, the “Taxonomy of Educational Objectives” is a framework to categorize learning goals and objectives. It originally consisted of six categories: Knowledge, Comprehension, Application, Analysis, Synthesis, and Evaluation. The categories after Knowledge were presented as “skills and abilities” with the understanding that knowledge was the necessary precondition for putting these skills and abilities into practice. Clickers, also known as in-class polling or voting systems, can be used in large lecture courses as a way to promote active learning. Using a small hand-held device, students answer questions posed by the instructor. Their answers are recorded by a software application on the instructor’s computer and can be shared with the class to provide immediate feedback. Recent educational professional development inspired my colleagues and me to leverage the benefits of clickers by improving, expanding, and diversifying clicker questions to increase student learning in our lecture courses. Piazza is an online question and answer style discussion board that offers useful features for facilitating communication among students, teaching assistants, and instructors. It provides a means to gauge student understanding of course concepts and allows instructors to engage with the students in an intuitive way in real time. Even the smartest undergraduates need to be taught that everything worth knowing won’t be found on a smart phone. Luckily, the Homewood campus offers endless opportunities for teaching from primary sources. The Hamburger Special Collections and Archives has everything from rare books, official university records, and historic photographs to films and artifacts, including a growing collection devoted to undergraduate life. Beyond the library there’s another world of primary documents to discover-artwork, memorials, even the very buildings where our students live and learn. With the right tools, and some help from the Center for Educational Resources (CER), I tried to bring these sources to life for the students and get them out of the classroom to experience the campus in an entirely new way. Prezi is a free, cloud-based, presentation tool that allows users to place content on a screen in non-linear order. Prezi uses a Zooming User Interface (ZUI) to enable navigation and display of content. ZUI is a term used in computing to describe a graphical environment wherein users can change the size of a viewing area by enlarging or reducing it, navigate by panning across a surface, and zoom in and out of content. A course syllabus can be more than a list of class topics and readings. It can give students an immediate sense of what the course will be about, what they will learn, and how they will be evaluated. A syllabus can provide students with an clear understanding of expectations, course support, and proper conduct in class. It is a students’ "first impression" of your course, which will resonate through the semester and excite them about the course content they will soon learn. When I started teaching at Hopkins, Blackboard was offered as the course management system and most faculty seemed to be using it as their primary means of communication with students. Although Blackboard has some useful functions, I was looking for a different set of utilities – ideally, a class communication solution that students would find intuitive, easy to use, and interactive. Facebook is an application that most students are already quite familiar with and have incorporated into their daily lives. It became the obvious choice to help connect and engage my students outside of our formal in-class hours. Panopto is a service that enables easy video capture, streaming, and sharing. While traditionally categorized as a lecture capture service, Panopto can do much more. The term ‘cloud’ refers to storing files on a remote server. Services such as Dropbox, Google Drive, and OneDrive provide cloud storage that keeps your files secure and backed up, ensuring that they are available when you need them. Access to your files will require an internet connection on your computer or mobile device. Such services typically offer a small amount of storage for free with fees charged for upgrading the services. Fortunately for Hopkins faculty, students, and staff, IT@JH offers a cloud storage service called JHBox with at least 25 gigabytes of storage per user at no cost. Instructors often seek student-centered, active-learning teaching practices. These teaching methods are intended to increase student retention and engagement but the ways in which they are implemented is important for success. Turnitin is a web-based service for detecting plagiarism and improper citations in studentsubmitted work. Johns Hopkins University has a multi-year subscription to Turnitin. All instructors in the Whiting School Engineering and the Krieger School of Arts & Sciences are covered by this subscription. There are no limits on the number of classes or number of student papers checked. Over 450 JHU faculty are registered Turnitin users, and in the past year, over 12,000 papers have been submitted to Turnitin to check for originality. Getting students to participate in class discussions is a common challenge. Every instructor has faced the dreaded silence after posing a question. Active learning activities can stimulate student engagement, but they can be difficult to implement in classrooms that were designed for lectures - fixed seating inhibits opportunities for collaborative exercises such as group work and discussion. VoiceThread is web-based presentation software that allows users to create and share interactive multimedia slideshows. VoiceThread presentations are used to showcase audio, video, images, and documents while allowing users to comment on them in a variety of different ways. The result is a digital conversation that can be easily shared with individuals, groups, and/or embedded into different websites, including Blackboard, the course management system used here at Homewood. One measure of successful teaching is student engagement. Instructors often find that student engagement increases when active learning strategies are implemented in the classroom. One strategy is to assign problem-based collaborative learning projects. Well-conceived group projects help students develop critical thinking skills, learn how to work in teams, and allow them to apply theories learned in the course to real-life situations, producing an appreciation for how the knowledge gained will be useful once the class is over. The end result is a richer learning experience for the students. Although learning by doing has always been an important pedagogical tool, it may be difficult to implement in courses where the active learning takes place outside of the classroom or lab. Creating course projects that involve the community gives students a chance to affect positive social change, but working outside of a controlled environment involves unpredictable variables that can hamper the active learning experience. As smartphones become more commonplace, the number of small, single-purpose applications (apps) grows. These apps are functional extensions of your smartphone’s built in applications; they are powerful tools that do not require a laptop or desktop computer. While most apps are created to entertain, some are created for productivity, communication, and collaboration; all of which can enrich educational experience. When Blackboard courses are created, access is restricted to members of the JHU community who are enrolled in each course (instructors, TAs, and students) and have working JHED IDs. But with the Guest Management application developed by IT@JH, it is possible to create and distribute guest login accounts that are open to anyone, including those outside of JHU. In most public health courses, statistical data are central to understanding population and health indicators as they relate to issues such as fertility and life expectancy. However, raw statistical data of one country do not usually illustrate that country’s geographical relationship to other countries or reveal broader global public health patterns. Visualizing the indicators of the countries based on their locations on the map can be difficult, especially since current resources do not usually map the latest data within a global setting, which is essential for contextual and spatial analysis. A wiki is a webpage or website that allows collaborative editing. A wiki invites participants to take part in the creation of the site content. Typically edits are tracked and a history of the contributions can be viewed. Assessing student work in large classes can be complicated when several faculty or multiple teaching assistants share the responsibility. In a calibration exercise, multiple individuals work together to score a sample of student submissions before dividing and individually grading the remaining student work. In an epigraphy course students learn to decipher and analyze inscriptions and manuscripts using traditional philological tools. The ultimate goals are to translate and interpret texts, but before they can begin to do those things, students need to become familiar with the physical characteristics of the ancient documents we study, especially the shape and other features of the writing itself. So our first job is to enhance the students' ability simply to "see" ancient writing, and this can be a challenge when using traditional tools. In-class voting systems, also known as "clickers," allow instructors to rapidly collect and analyze student responses to questions posed during class. Clickers can make a class more engaging and encourage students, who often refrain from answering oral questions in class, to contribute to class dialog on questions posed by the instructor. Instructors can also obtain real-time feedback as to how well students understand concepts taught in the class. Image resolution is a concept that always comes up when working with digital images. The resolution of an image has implications for the final output of the image, whether that output is a printed poster or an image on a website. An understanding of image resolution ensures that the end result is clear, crisp, and of an appropriate file size. Faculty profession of knowledge used to rest on the firm foundation of the principle of authority. Most students granted their teachers respect and sometimes deference as a matter of course. That foundation has been crumbling for at least three generations. The new digital technology has virtually razed it. As college teachers, it is imperative that we realize what this means for our relationship with our students and for the future of education. Facebook is an online social networking service, designed to enable users to build communities of people who share interests. Social networking services provide different ways for users to interact online through tools such as virtual bulletin boards, blogs, wikis, e-mail, and instant messaging. Users can also share content, such as photos and videos. The name "Facebook" comes from the term for printed directories of student pictures and information distributed each year to incoming college freshmen so that they can identify each other. Strategic use of images in the classroom helps engage students who have grown up in a media-rich environment. Digital technology makes images more readily available and easier to incorporate into teaching and learning materials. Applied science programming courses typically involve the instructor writing examples of code during class as students follow along at their computers. Students may occasionally work through simple examples on their own, but they spend most of class passively watching the instructor. Blackboard is a web-based course management system that allows instructors to present course material and interact with students in an online environment. Depending on the instructor’s needs, Blackboard can be used either to supplement face to face courses or present courses entirely online. The complementary relationship between teaching and research was integral to President Gilman’s vision in establishing Johns Hopkins. Great researchers bring new ideas and practices into the classroom for the benefit of students, who can in turn contribute to new discoveries by engaging in the research process. ARTstor is a non-profit digital image library available through the JHU Libraries. It consists of over a million images, along with essential data, of subject matter relevant to many disciplines. Despite its name, ARTstor isn’t just pictures of art or humanitiescentric. It contains images that are of great value for didactic and illustrative purposes in the social sciences, basic sciences and engineering.